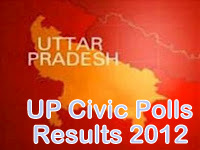 After the drubbing in assembly elections three months ago, BJP in Uttar Pradesh was on Saturday buyoed by the success in three-tier urban local body polls. "Despite the defeat in assembly elections, we decided to contest the local body polls on the party symbol and due to combined hard work of leaders and workers and support of the public, we have achieved grand success," BJP state president Laxmi Kant Bajpai told reporters in Lucknow. Maintaining its dominance in urban local bodies, the party on Saturday won 7 of 12 Mayoral posts in municipal corporations in the three-tier elections. He said while Congress contested directly and was badly defeated, SP and BSP were in the fray indirectly by supporting independent candidates and lost. "In local body elections, party workers and all national and state leaders rose above "I" and worked as "we" and victory is the result of this," Bajpai said. He claimed it was clear from result of the urban body polls that SP magic on public during assembly elections was waning and people have rejected it's policy of Muslim appeasement. Bajpai termed results of local body polls as a "positive signal" for BJP ahead of 2014 Lok Sabha elections. "Lok Sabha elections will be contested by formulating district-wise strategy and the state unit would make an important contribution in brining BJP-led NDA at the Centre," he said. This result is due to the possibility of Narendra Modi leading the BJP in 2014.Further the Goonda raaj of SP has also supported BJP.